Cell references disallowed Names cannot be the same as a cell reference, such as Z$100 or R1C1. Spaces are not valid Spaces are not allowed as part of a name. Use the underscore character (_) and period (.) as word separators, such as, Sales_Tax or First.Quarter. Check out screen cast below to see it happening. 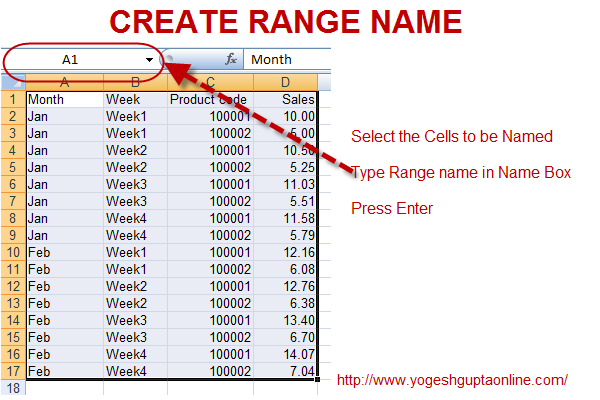 Named ranges is part of defined names in excel. It is just not limited to a cell on the worksheet or range of cells, it can also be a constant or a formula in your workbook. 1. Make your formulas much easier to understand. 4. Can be used for conditional formatting based on contents on another worksheet. 6. Use them as constant value without referring to contents on your worksheet. Will be covering some of the topics in my upcoming posts, so stay tuned to learn more uses of defined names in excel. In my previous posts I have shared EMI Calculator with you. This was mode using Excel PMT function and Spin Buttons ActiveX Controls in Excel. 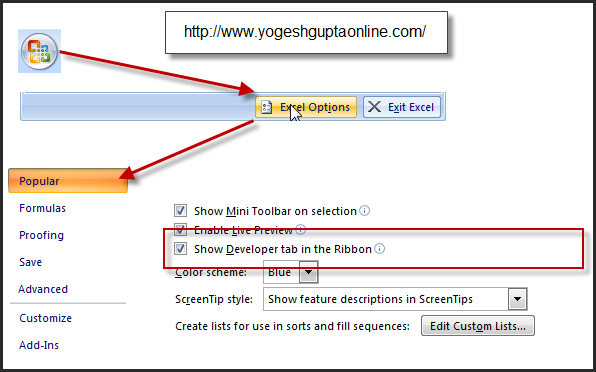 In this post I am sharing how to add spin buttons ActiveX controls to excel worksheet. Step 4 Draw Spin Button on your worksheet. Similarly add two more spin buttons next to Interest Rate and Years. Rename them as Interest and Years respectively. In my previous post I shared EMI Calculator with you. In this post I am sharing how to make EMI Calculator. This has been done using PMT Function in excel to calculate EMI amount and Spin Buttons ActiveX Controls to fine tune the amounts. PMT Function Calculates the payment for a loan based on constant payments and a constant interest rate. For calculating EMI you need 3 inputs. RATE : is the interest rate for the loan. In case you are making monthly payments devide the annual rate by 12 to get monthly rate. NPER : is the total number of payments for the loan. When payments are made on monthly basis you need to multiply number of years with 12 to arrive at total number of payments. PV : is the present value, or the total amount that a series of future payments is worth now; also known as the principal. We take this figure as (-) Negative in our formula since it is receipt of funds. FV : is the future value, or a cash balance you want to attain after the last payment is made. If fv is omitted, it is assumed to be 0 (zero), that is, the future value of a loan is 0. In our formula we omit this figure as we need to reach zero balance at the end of term. Type : is the number 0 (zero) or 1 and indicates when payments are due. If payments are due at the end of the period use 0 or omit this figure. use 1 if payments are made at the beginning of the period. In our formula we have omitted this. Flat Interest Rate : = (Total Amount with Interest - LoanAmt)/LoanAmt/Years : Many financiers talk about Flat interest rate while landing money. 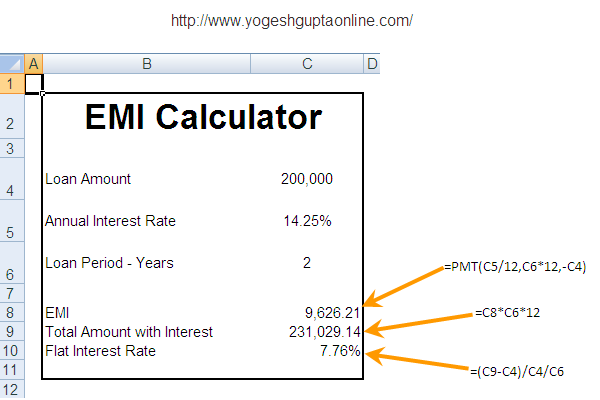 They calculate simple interest on entire loan amount for entire period of the loan. Many people go for the loan without understanding the actual interest rate. Flat interest rate looks very attractive as it is much lower than the actual interest rate which is calculated on reducing balance. You can see the difference in the figures above. So be careful while borrowing on flat interest rate. In next post I will cover Adding Spin Buttons ActiveX Controls to Worksheet.